Fancy getting your hands on a DVD of last year's hit flick Eat Pray Love? Well we've got five to give away TODAY! 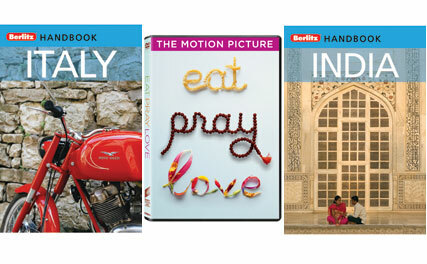 Fancy getting your hands on a copy of last year’s hit travel flick Eat Pray Love? Well we’ve got five DVDs to give away TODAY! Eat Pray Love is the true story based on Elizabeth Gilbert’s best-selling memoir. Newly-divorced and at a crossroads, she steps out of her comfort zone, risking everything to change her life and embarking on a journey around the world that becomes a quest for self-discovery, travelling to Italy – where she visits the capital of Rome – to India and Bali. At some point we’ll be posting a Eat Pray Love-related question, and the first five followers to Tweet back with the full, correct answer will win a DVD and Berlitz Handbook.